YouTube isn&apos;t the only Google product getting movie rentals this week. 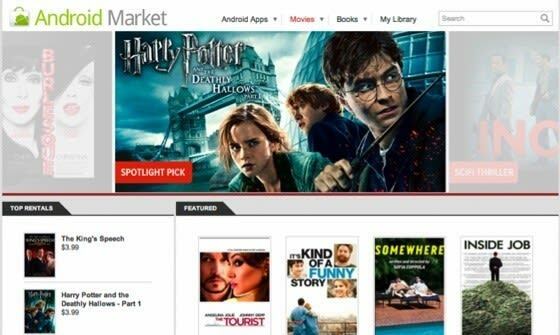 At the I/O conference, Google has announced digital movie rentals for Android devices via the Android Market. Similar to the recently announced YouTube model (and to that of Amazon and iTunes) Android customers will be able to pick from thousands of movies to stream for a price ranging from $1.99 to $4.99 for premium titles and HD content. Once you buy a movie, you have 30 days to start watching it. But once you press play, you&apos;ll have to finish the movie within 24 hours. Movie rentals are available with Honeycomb 3.1 (downloadable today if you have a Motorola Xoom, and sooner than later if you&apos;re rocking another Honeycomb tab) and with a coming update of Gingerbread expected in a couple weeks.